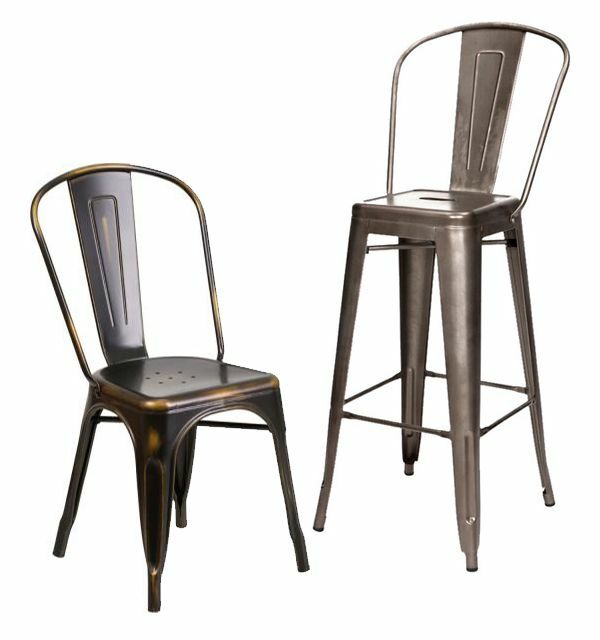 These Rustic Metal Chairs are available in both chair and bar stool sizes (barstool heights of 24" and 30"). The Rustic Metal Chairs come in a variety of colors (see below) and have a distressed finish and will add a midcentury modern flair to any setting. This versatile chair easily transitions between multiple styles and designs, from an old country barn, to modern industrial hangout, to vintage elegance. Rustic Metal Chairs are lightweight and easily stack for storing. A cross brace underneath the seat adds extra stability and features protective caps that prevent the finish from scratching when stacked. The legs have protective rubber feet that prevent damage to flooring.